This private, secure, and comfortable first level apartment has a small kitchen with stove/oven and refrig, its own covered porch, and a view the Lake Atitlan volcanoes. The short 5 minute walk to town makes it easy for shopping, activities, and restaurants, but far enough for quiet nights. The doors and windows and kitchen for this apartment were hand built by me, having been a cabinetmaker in the states for 25 years. The matrimonial bed is provided with 100% cotton sheets, and the bathroom, with 24 hour hot water from a brass rain shower head, sufficient towels, and complimentary shampoo and soap for stays less than a week. There's also a single bed that serves as another couch during the day and to sleep a third person. I am an acoustic blues musician, who passionately loves pre war country blues. I just recorded my first CD, Lucky Seven, in 2014 in London. Although I was born and raised and educated in Pennsylvania, I have lived on Lake Atitlan, in San Marcos La Laguna, Solola, Guatemala for twenty years and am married to Catarina, a Maya woman born here on the shores of this lake. I love the Guatemalan people and culture, and also have a restaurant here, called Blind Lemon's which features good food and treating guests to some live blues. I also occasionally have acoustic blues guitar workshops here and also have private students. I have two beautiful guest apartments here in San Marcos that have great views of the lake and it´s volcanos. I have built these with local workers who have been with me for years, and I have done the woodwork and built a lot of the furniture, as I worked for years in the states as a cabinetmaker. I feel that my wonderful quiet, secure, and beautiful compound here is much more enjoyable when I can share it with guests. I loved my time at 7 Volcanes! Very comfortable and clean with all the conveniences. I can't say enough about Carlos he was so helpful before and during my stay. I especially enjoyed the lovely garden listening to the morning birds sing. We stayed a total of 6 seeks at 7 Volcanoes and loved every minute of it. The apartment was very well constructed and maintained. Comfy accommodations that were walking distance to everything was perfect. The secure property was perfect for our black lab, Aspen, to be able to play fetch and lay about in the sun. Carlos was super helpful, even finding us secure parking for our truck nearby. His restaurant, Blind Lemons, offered up tasty dinners and we enjoyed many a fun evening watching movies on the big screen or listening to his Funk Blues. Highly recommended. Yeah, and I enjoyed it too! Thanks so much....it was a great six "seeks"! haha Look forward to you coming back! 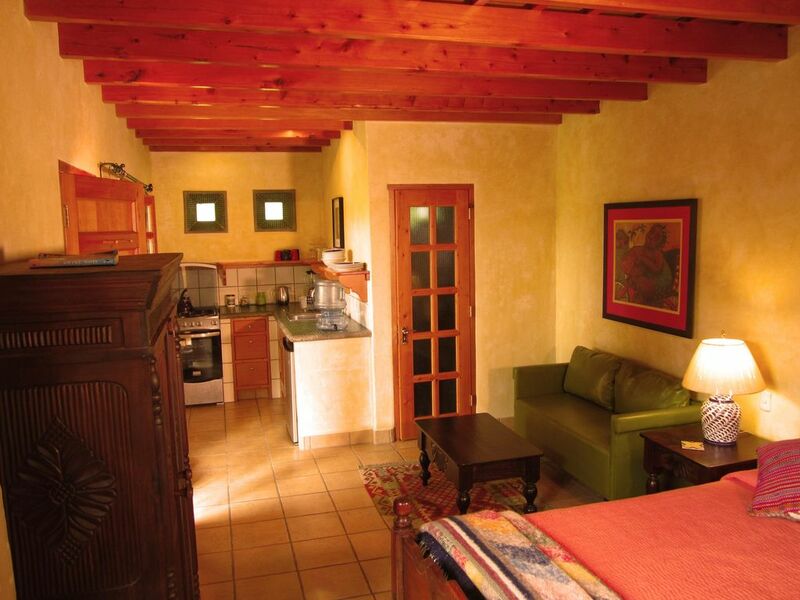 Set a five minute walk from the town, it is very quiet and secluded, ideal for a relaxing time. The property is in excellent condition and very clean. Carlos was an excellent host who went out of his way to make sure we had everything we needed during our stay. The place was very nice and everything was up to date. I highly recommend it! Thanks. Please come back sometime. we enjoyed our 2 week stay in San Marcus La Laguna, tremendously. The apartment is well designed, clean, quiet and contained all we needed for simple home cooking. Carlos, the owner is a masterful furniture builder, who also lives in the same compound and was always accessible for any questions or needs. We had some problems obtaining cash and his 'TAP' app was a true saver for us. San Marcus has no bank or ATM machine access. His restaurant "The Blind Lemon' serves excellent food, and Katarina his Guatemalan wife and her family are wonderful hosts. Carlos is also an accomplished old timey Blues player and entertained at the restaurant on Friday nights. The walk "downtown" is not too far, but at night a flashlight is needed. We hiked the back trails up hills and took the boats to the surrounding villages. Each one is different in its own unique way. The Mayan people at Lake Atitlan maintaining their culture and language, including weaving and other ancient skills and seem to be in harmony with alternative lifestyle seekers, travellers and tourists from all over the world. Thanks, it was a pleasure to have you!